Lack of narrative cohesion (Only one worker can go to market? ...seriously?) means consequences often feel abstracted: 'That one time I scored a huge bonus tile' has nothing on 'That time I blew up your entire fleet with a last-ditch superweapon.' There's also that old nugget about player interaction. Simply put: I like when stories happen in games. Eurogames tend to put a lot of layers between me and the narrative. I therefore dislike eurogames. Scythe is a eurogame by Jamey Stegmaier (with art and worldbuilding by Jacub Rozalski) that I took the shrink off 5 days ago. I have since played it 6 times. It's a weapon of war AND a farming implement, see. It is 1920s Europe, in an alternate history where the First World War was fought with giant mechs. The enigmatic city-state known as the Factory - who armed all sides of the conflict with these marvelous machines - has mysteriously shut down. Your nation has sent you in to colonize the surrounding lands and explore the Factory in search of riches and glory. The production quality is, frankly, superlative. The cardboard is absurdly thick, the box is sturdy as hell, the resources are molded wood models instead of colored cubes. LOOK AT THIS PLAYER MAT. Double layered! With slots for your components! Wednesday the cat assists in testing the tray's resistance to gravity. Result: Good. 1) Select one of the 4 actions on your player mat. 2) Do the top row action if you want. Then do the bottom row action if you want. Scythe can be taught in minutes (mostly by reading from the reference cards) and explaining each of the 4 actions. Explain that you can't take the same action twice in a row, and partway through the game, do a mock scoring. That's it. But at the same time, that's so not it. The design has not been polished so much as sandblasted; nothing here is extraneous. One gets the sense that if it couldn't be simplified down into its most basic form, it was cut. I could ramble for paragraphs about this but I'm going to show it with just two of the game's systems: upgrades, and combat. ...revealing the extra benefit beneath. ...where it permanently reduces the cost of that action. The upgrade system is a tech tree that players don't have to memorize, does not require additional components, is built right into the player mat, and is incredibly satisfying to physically manipulate as well as take advantage of in-game. It's genius. Pay power using the dial on the left. Add combat cards which you can draw with your actions. Add the two values together. Highest number wins, attacker breaks ties, and the ratio of combat cards is printed right on the board. Scythe bills itself as a 4X and it ticks every single X in a way which is rewarding on a really primal level. Actions are simple and immediate – I produce, I instantly get resources. I move, I see how my units spread out for future production, or gain access to the Factory, or have an Encounter. The encounter cards are a huge reason why I enjoy this game. Apart from the fairly large rewards for exploring, encounters create a sense of narrative as you push your way out across the board. Even the board itself creates narrative because as you expand your empire, you're not colonizing random hexes - you're moving through a land with churches and lakes and mountains and a history. Why are there two farms next to each other next to a village? Who lives there? And how do they feel about me parking 100 foot death machines on their fields? Everything you do in this game is enormously satisfying. Mechs give special abilities to your entire faction. Buildings, recruits, and upgrades permanently improve your player mat. Gathering power, popularity, and resources let you set up for future turns as well as improving your shot at endgame scoring. Playing this game was like opening a watch to look at the gears in motion. Scythe's systems spiral and coil and interlock, and none are wasted. Everything here has earned its place. Every symbol on every card and mat has been meticulously placed. A stunning amount of thought has been put into its design, and it shows so strongly in every aspect. Nordic artillery mechs walking on water. Saxon troops barricaded deep in the mountains. Crimean raiders appearing seemingly from nowhere. Each of the game's five factions – with their unique faction powers, mech abilities and starting location – will have something for everyone. Variety is further introduced by the player mats, none of which are the same. Note the different combinations of upper and bottom row actions, and the variations in rewards. Because of this, a Rusviet player with the Industrial mat has to play very differently than a Rusviet with Agricultural or Mechanical – greatly influencing your path to victory. Continuing to muddy the strategic waters are, of course, your opponents, who will be doing different things each game as well, leading to tons of variety over the game's lifespan. Nitpick: Even though each faction has an adorable animal companion, said animals are distinctly underused. One has the impression they were included as part of the design but were streamlined out over time. The game is probably better off without extraneous 'pay 2 to move your animal 1 space' rules, but come on, don't tell me you don't want to sic a muskox on someone. Expansion module plz, Jamey. Scythe’s immediacy makes it very clear to see if your turn was good or not, and this strong sense of feedback removes that common Euro problem where you feel like you were doing okay only to find out you lost by a mile. Having a series of good turns means you can maintain a broad play structure, allowing you to pivot into different plans as needed. Tunnel-visioning on one strategy can work, but you have to be prepared for disgruntled opponents marching across the map with murderous intent. Hallo! Which way to IKEA, please? At the same time, being laser-focused on efficiency can bouy you across the finish line before the other players have even gotten a good run down the straight. 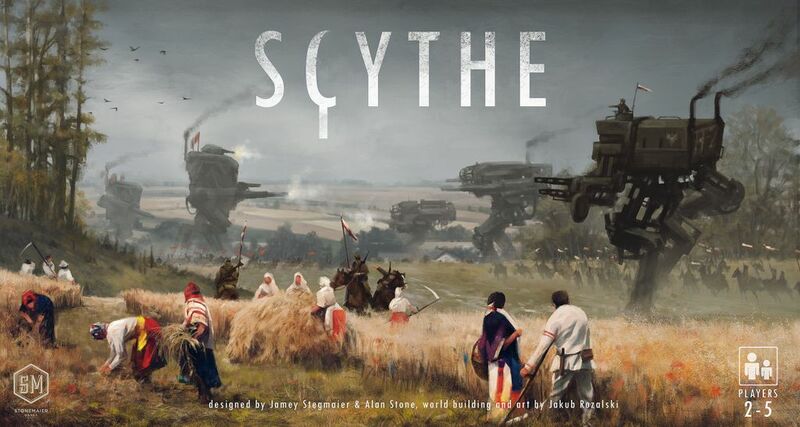 By allowing broad styles of play combined with the large amounts of variety mentioned earlier, Scythe has potential for incredible depth and replayability. I once won a game where I never visited the Factory. It's definitely possible to win without building a single mech. And if you do win, you get to fill in your name on the achievement sheet next to the deeds that you accomplished that game. (Some are extremely difficult.) It seems like a gimmick at first, but like just about everything else in this game, the achievements are about getting players to experiment with different play styles. Is it worth never building any mechs in order to get that endorphin hit of writing your name on a high score screen? More importantly – can you actually do it? Nitpick: Language independence took priority over ease of use. I had to stare at a couple of cards to try and figure out exactly what the iconography meant, but the symbols are universal and explained in the rulebook, so I got it eventually. While we're nitpicking, the board unfolds in a very unintuitive way. Given how flipping huge the board is (six folds!) and how popular this game is going to become amongst my group, I have the irrational fear that I'm going to rip the seams every time I unfold it. I like to keep my collection small, but Scythe is going onto my shelf with a thunk (oh man is that a heavy box) and staying there. I heavily dislike most Euros, but this game isn't most Euros. I mean, which Euro lets you do this? Frolicking AND Bear Cavalry. In one card. This review was originally posted on Ding and Dent Cast. Re: A non-eurogamer's review of Scythe. Wow, really great review, thank you! I enjoyed the nitpicks too and appreciate the level of critique! Cannot wait to get my copy. Hurry up USPS! You make a persuasive argument, Calvin. Man, and I was saving up money, too!! Wow. Fantastic and informative review! My copy arrived last night... and as if I wasn't already excited; now, I'm really looking forward to getting Scythe on the table this weekend. Thanks! JE SUIS VENU. J'AI VU. JE SUIS PARTI. "Pay attention to that word, by the way: 'satisfying.' That's the dominant emotion I feel whenever I play Scythe." Great write up! I do have one suggestion though, your picture files are way too large and take forever to load. I would suggest reducing the size to 550-750 pixels wide and reuploading them. Super long load times may reduce peoples desire to stick around and read. GAH ok I'm NEARLY sold on this. I was worried it might be too dry; I generally don't love Euro games either. I thought Viticulture was... ok. I didn't like its mostly passive interaction (WP blocking) and thought the action cards were too random for a mechanism so important. It seems like those aren't issues here. My only last question is this. Each player board has similar actions, yet some favor distinct strategies by making those actions more efficient. Is it easy to ascertain what your board is "good at"? Or does it take a lot of comparing your board to other players' to really see where your efficiency is? Really well done review. My copy arrived on my doorstep yesterday. And true confession -- I had COMPLETELY forgotten that I had even ordered the game 6ish months ago. Looking forward to giving this a play. There's two things that vary board to board: the order of the top row actions with respect to the bottom, and the costs and rewards on the bottom row actions. Your board is going to be best at the things where the top and bottom feed into each other, and/or the things that cost 2 resources rather than 3 or 4 for the bottom actions. How to take advantage of it, though? And how to make the less efficient spots hang together for a strategy? That's much harder to see, which is good, because that's where the interesting decisions are. First off, I'll echo the other folks in here and say that this was a great review! Quite well written, and hits all the important notes. It is a solid game, I generally like euro games and this has a good mix of euro with a mild bit of story along the way. I found it borrowed the best elements from Hansa Teutonica, Terra Mystica, Assyria, Dead of Winter and Dune/Rex. The only issues I had with the game was the combat, I liked the dice less Dune style resolution, but the just go back to your corner after you loose was a battle was a little lame and felt like combat was tacked on. I also didn't like the immediate end once someone places their 6th star, as in the game I played the player that ended it was the start player, so that got an extra turn. I didn't think this was fair to the other players. My only gripe with the production was that the race player boards should have had dual layering like the action board. Just would have been nice to have the mechs and recruits sitting in a little slot. I also enjoyed the encounter cards, they reminded me of the Dead of winter cross roads cards, they just added a little bit of flavour to the overall gameplay. One of the designer notes says that the higher numbered player mats are a little better to balance the start player advantage. It is easy to miss the rule that the lowest number should be first player. The higher numbers get a bit more in terms of resources/cards to balance it out. You like it, then. Yeah, I'm going to go out on a limb and say I'm pretty sure you like. Can't wait for my copy to arrive. Great report...wonderful pictures and wonderful alliteration. Thanks everyone for your kind words! If you enjoyed this review, I have other writing over on Ding and Dent which you can check out. Dbonzai: Thanks man! Hope your copy has already arrived. GO USPS! varneysa: How did your playthrough go? I'm excited to hear! Reverendunclebastard: Re: the images Yeah, that was my bad. I resized them at the source so hopefully things are better now. elilepticemu: It's really obvious by looking at your own mat. There's only 8 actions on the mat shared across all players and it's really easy to tell your own combinations. Slumpy: Thanks dude. I hadn't taken any pictures for review before. It takes way longer than you expect! Its this type of review that makes me almost buy Scythe. I'll get to why I say almost in a second. As a firm AT gamer I like games that have some kind of narrative and oomph in them. That actions you take in the story are reflected within the mechanics and the 2 interplay with one another. Scythe seems to do that to an extent which is great. Here is where my almost comes in. Scythe (along with a few others) still suffer from the Euro ending of "get enough points." Its akin to when you're working at a new job. They talk about how employee happiness, work culture, and inclusion are all the rage. Those are all so integral to making the company work that these facets simply couldn't be ignored! However strip the cute talk and buzzwords away and what do you have? A profit driven machine. I'm not saying that's bad or that it shouldn't be that way. It just feels deceptive. My point is I have these euro-games that have elements of story and flavor that impacts the gameplay.......but it all ends at that same abstract finish line of "get the most points" or "end at turn 6." Does this sort of teasing bother anyone else but me? I love what Scythe does. I love everything that it conveys but that abrupt ending of "ok flirting with AT is over. Time to wake up to the Euro reality" is what shakes me out of my reverie and causes me to admonish the game. I think had the game had a little more narrative and a less abstract ending to it then it would've sealed the deal for me. As part of the Scythe team, I was asked about the abrupt ending in Scythe and Euros in general. As a reply I wrote a blog post where I tried to explain why Euros end the way they do: Anti-climactic endings in Euros? Thanks! Well written post. I agree with a lot of what you had to say. And for clarification; I heavily lean AT but that doesn't mean I don't own or don't like euros. One of my favorite games is Power Grid. I enjoy sometimes simply trying to engage in a contest where I prove I can navigate through a set of rules and conditions better than other players. Most times I want stories and simulations but I'm open to both . I also like both schools of design. I think I mention in the post that my favorite game is Dawn of the Zeds, which in my opinion is a heavily thematic AT game. Very nice and easy-reading review! And what about the number of players? is it ok with 2? alone? with 5? Carquinyoli: The only player count I have not played is solo, but every other count is still pretty good. I do not actually have a favorite player count because I like them all. I haven't timed them very closely but yeah it's more or less 2 hours. I think 2 player with people who know what they're doing can be faster. It all depends on the players, I have had a 5 player game last 1 hour, and 3 player game 3 hours. Like any game it depends on who is playing. I didn't like it solo as a lot of the rules are changed and it is a bit boring. Best with 4 or 5.